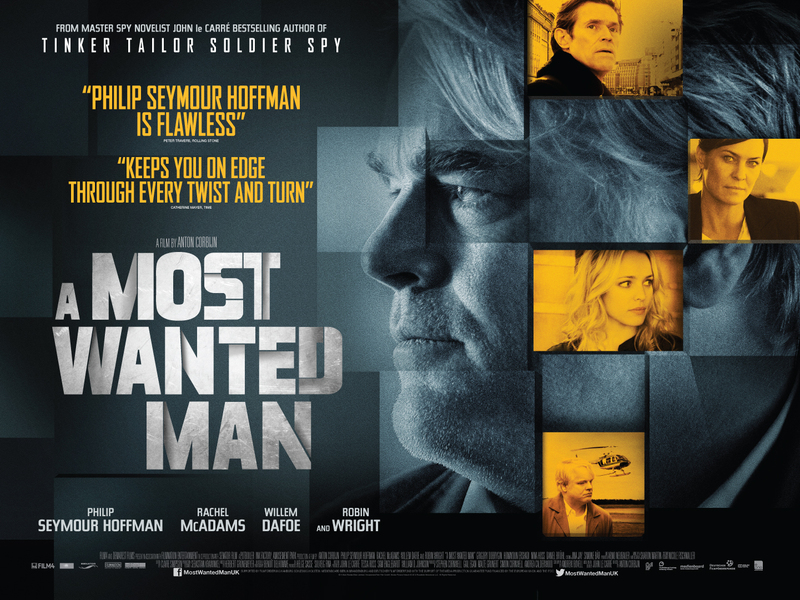 Philip Seymour Hoffman was definitely a most wanted man for this drab moody political thriller. A showcase and a reminder of the loss of a talented actor. The film will certainly not soil’s Hoffman’s prestigious reputation. But Anton Corbijn on the other hand . . . not so much. A drawn out and needlessly complicated thriller that proves to be oh so simple and tedious that the 127 minute length just doesn’t justify itself or keep you engaged. It was always going to be tough to do a spy film these days, especially after nine series of Spooks, Tinker Tailor Soldier Spy and Homeland. The opening score and the subtle title sequence was nostalgic of the 70s political thrillers. A good sign. The moody overtone captured perfectly against the Hamburg backdrop by the cinematography of Benoit Delhomme. The story was typical John le Carre. Spies lurking in the shadows. The inevitable waiting game as a mystery man washes up on the banks of Hamburg after evading capture from Russia. Is he a terrorist? A man sneaking refuge from a torturous nation? Or a distraction for a bigger play? The inevitable chess game as each agency fishes information out one another waiting to see who makes the first blunder or bluff revealing their intentions. Each move carefully analysed and discussed. Cryptic references and stories that are saying something without saying something. Grigoriy Dobrygin plays the mysterious Issa very well and will certainly be one to watch. However, the main scene stealer was (and was always going to be) Mr Hoffman. The opening half hour was PSH chain smoking and walking a lot of steps. It was a waiting game and believe me you felt like you were. Hoffman is a fantastic presence along with a flawless accent. He doesn’t break out of his German twang once. The same cannot be said for Rachel McAdams who certainly gives it a punt but dips in and out. Not everybody can do it. Willem Dafoe was surprisingly good but his character was wasted as the film churned along. The mystery soon borders on pretentious and just plain dull. Maybe Andrew Bovell and Anton Corbijn should have taken some lessons from The Lives of Others. Slow burning but tense, intriguing, hypnotic with a nail biting finale. This was just slow. Corbijn had impressed with his previous efforts: Control and, more importantly, The American. Suspenseful, tense and brilliantly shot. I understand it was adapted from Le Carre. But even some of his weaker and less renowned works still had some intrigue. The hour marker allowed Hoffman to shine and show what we will miss from him and that is his acting prowess. Delivering lines with tenacity and conviction. Pumping some life into this lead balloon. The sense of paranoia and fear against the post 9/11 backdrop certainly provided a suitable catalyst. Robin Wright playing the American envoy who gate crashes the party was good. Sweet and supportive in one second, cruel and commanding the next. Typical. Some will smile. The fractious tension between the Americans and Germans is set up perfectly in the relationship between her and Hoffman. The film finally appears to be getting somewhere, setting things up for a tense finale, only for it . . . to fizzle away abysmally, becoming a lazy statement that is all so predictable. Commentary that has been made time and time again. A look into the inner working of politics between the agencies was interesting if void of suspense. PSH didn’t look particularly well. He looked rough. I mean he never was the epitome of physical health but it certainly puts an air of darkness around the film, especially knowing that this was his last film to grace the silver screen. Daniel Bruhl was completely wasted in the role. A nothingy supporting role, a mere cameo that didn’t do him any justice, especially after the prolific year he has had appearing in Rush and The Fifth Estate. Anyone could have played him. It is a good a send off as we will get for the man. The problem with these slow burning poker games, I’ve seen them done so much better. I have patience for pace if the characters are interesting enough to keep me peaked. We were watching one man as Hoffman spurned cryptic babble to a number of agencies trying to enforce their own method of politics in the veil of “counter terrorism”. Homeland proved that watching one man could be interesting but here’s the thing the man actually did something. Not hang around in a bedsit praying, whining and trying to pull a Mean Girl. (Okay, Homeland did do that too). Dull, drawn out and desperate. For every little move, a nightclub chase here, it was crushed with one chess piece, being endless dialogue and conversation that went no where. It certainly captured the look and had a prolific star that will certainly be missed but had to little in terms of suspense and intrigue for me.